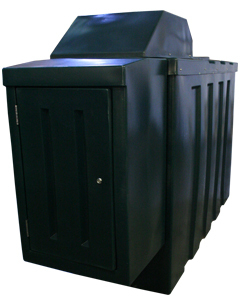 Our NEW 1900 litre fuel dispensers is the perfect fuel dispensing unit for farms, commercial and industrial units. It's bunded construction conforms to the latest environmental regulatations and health and safety requirments. The dispensing of fuel is critical to organisation management and profits. Our 1900 litre fuel dispensing unit come fitting with a reliable 52L/min Piusi diesel pump and flowmeter. Also an automatic nozzle and 4m of delivery hose is included. Re-fueling this dispenser couldn't be easier, we have installed an offset 2" BSP non-return fill point. This is a standard fitting that is suitable for all refilling companies. Only suitable with diesel or biodiesel upto B5. Q: Can I use a bunded oil tank to dispense fuel? A: No you must use a purpose made fuel dispenser which stores the hose and dipsensing nozzel in a cabinet.